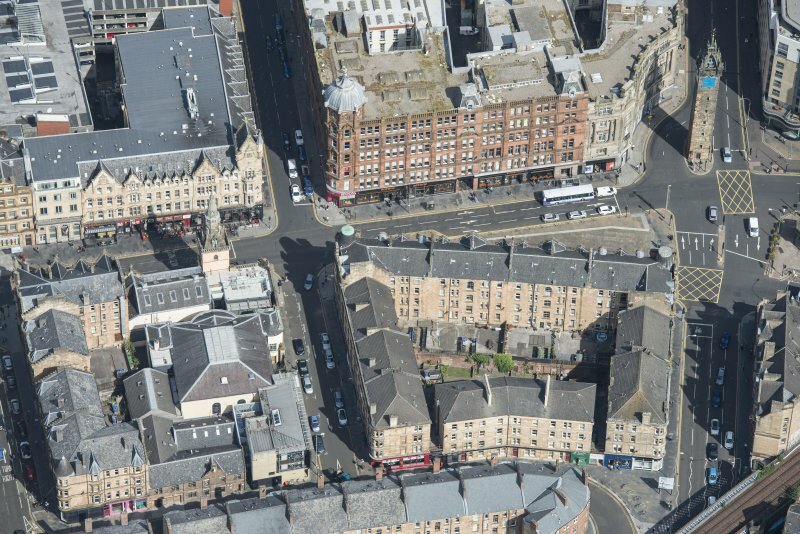 Oblique aerial view of the Trongate and Bell Street, looking NW. 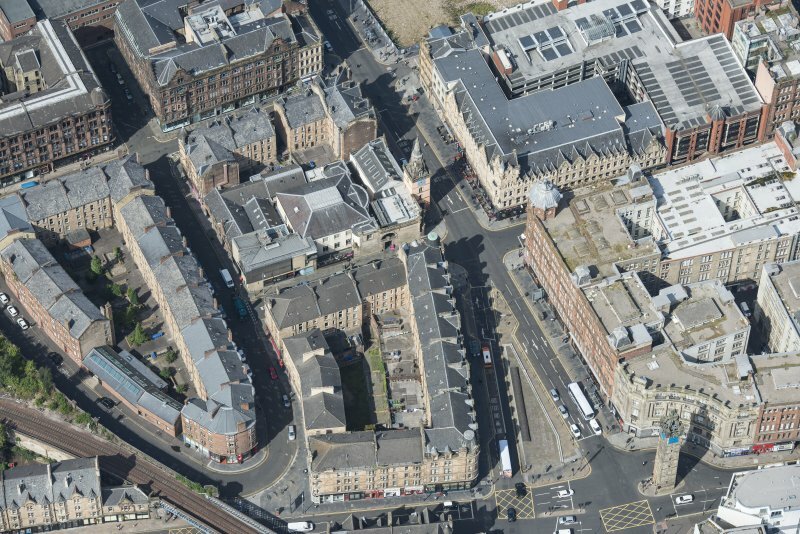 Oblique aerial view of Trongate, High Street and Bell Street, looking NNE. Historic photograph and drawing combined. Taken from 'Photographs of Glasgow, with descriptive letterpress', Rev. A. G. Forbes. 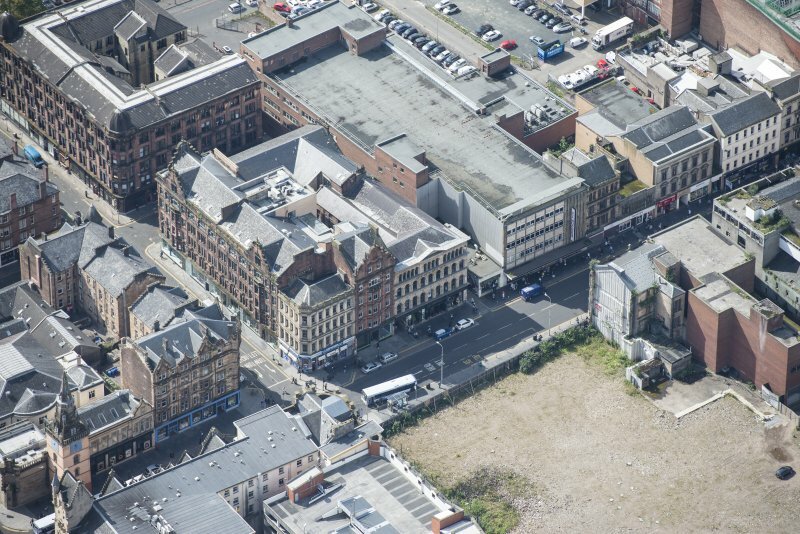 Oblique aerial view of the Britannia Music Hall and Tron Steeple, looking SW. Photographic copy of N elevation, section from S and plan. 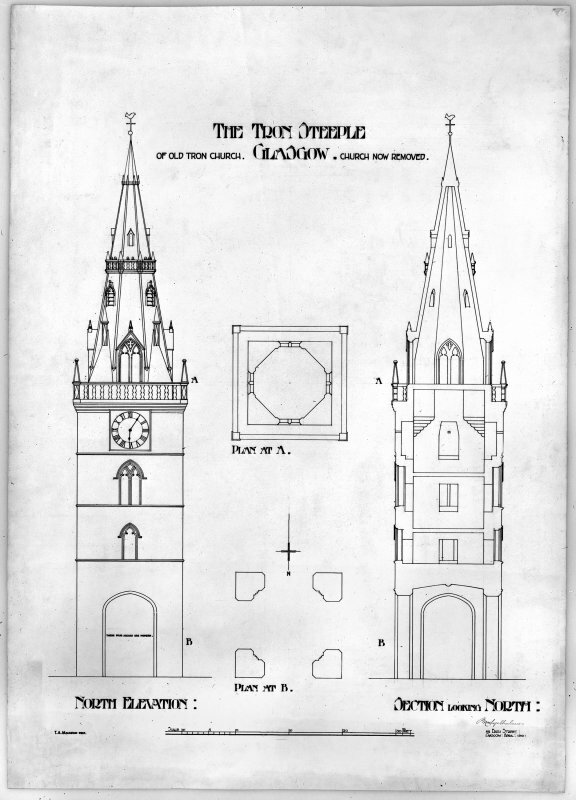 Titled: 'The Tron Steeple of Old Tron Church, Glasgow, Church now removed' 'T A Macadam Delt' Signed: 'MacGregor Chalmers' '95 Bath Street, Glasgow, April 1910'. Digital image of E/12173. 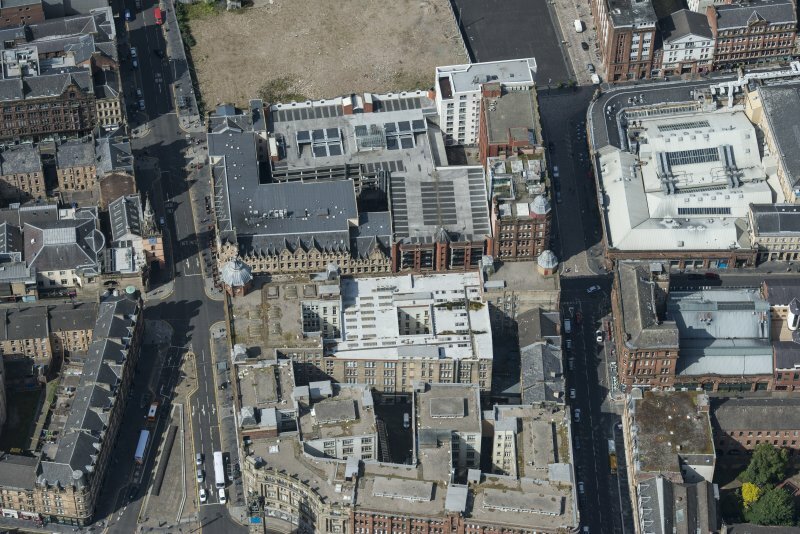 Oblique aerial view of the Tron Kirk and Steeple, looking S.
Oblique aerial view of the Trongate, Candleriggs and Bell Street, looking W.
Oblique aerial view of the Tron Kirk and Steeple, looking ESE. 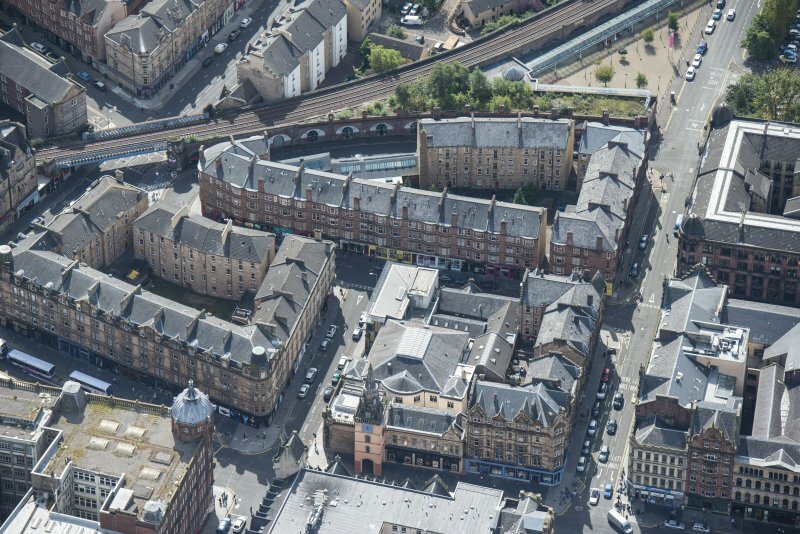 Trongate. 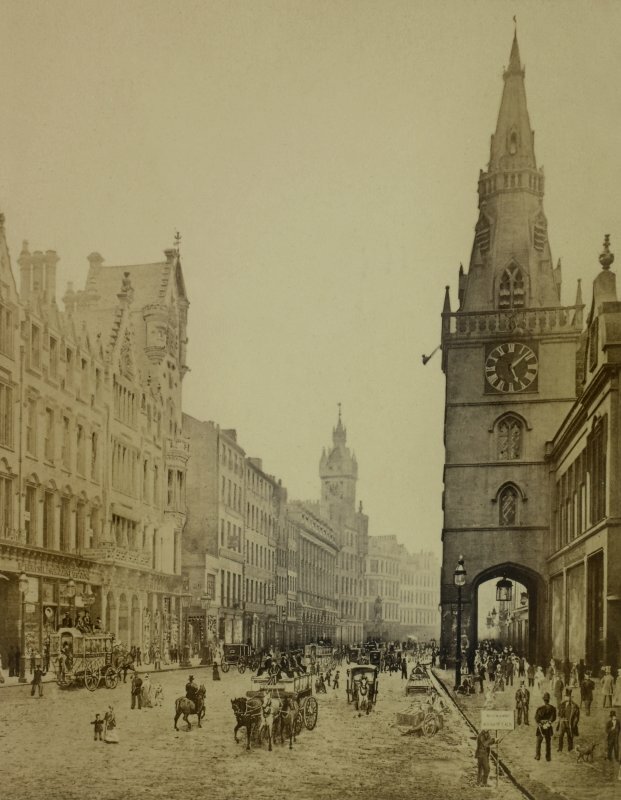 Copy of historic photographic view of Tontine Hotel, Tontine Building, Town Hall and Steeple. The Collegiate Church of Our Lady and St Anne was founded by James Houston in 1525. After the Reformation it and its adjacent cemetery were disposed of by the town council, but it was reacquired and put in order for use as a protestant place of worship, also known as the "Laigh Church", or "Tron Church". A tower was added to it in 1628. The church burned down in 1793, only the tower being left. In 1794 the present Church was built, on a new plan, separate from the tower. D E Easson 1957; H Scott et al 1915-61; R Renwick and J Lindsay 1921. The Tron Steeple still stands in a good state of repair. 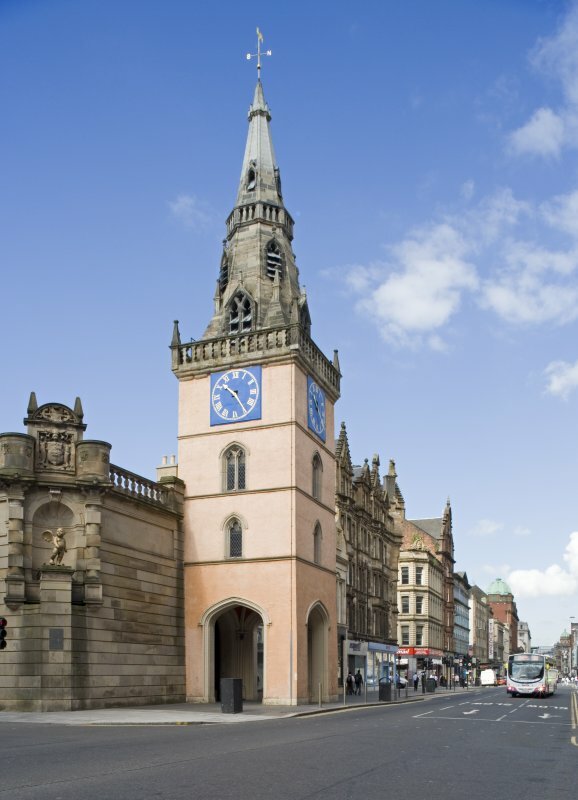 It has been recently renovated by Glasgow Corporation. Visited by OS (WMJ) 5 September 1951. NS 595 648 In November 1996 SUAT carried out trial excavations in advance of redevelopment and refurbishment at the Tron Theatre. 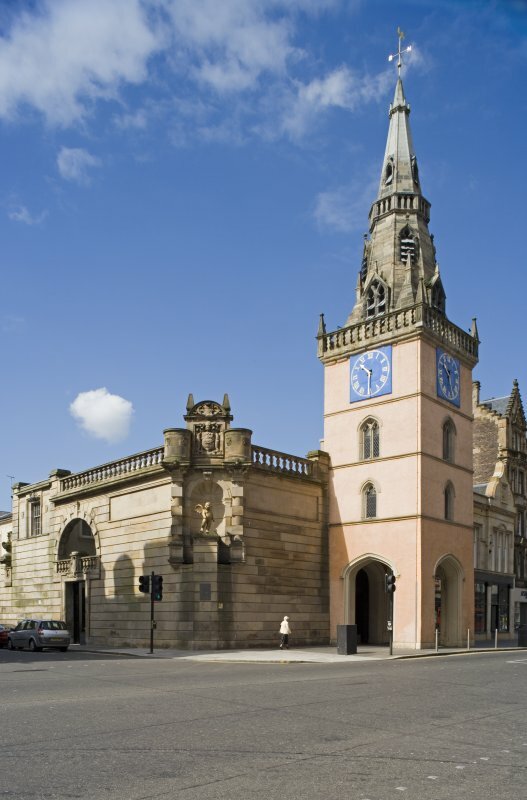 The theatre stands on the site of the collegiate church of St Mary of Loretto and St Anne, founded by James Houston, sub-dean of Glasgow, in 1525. 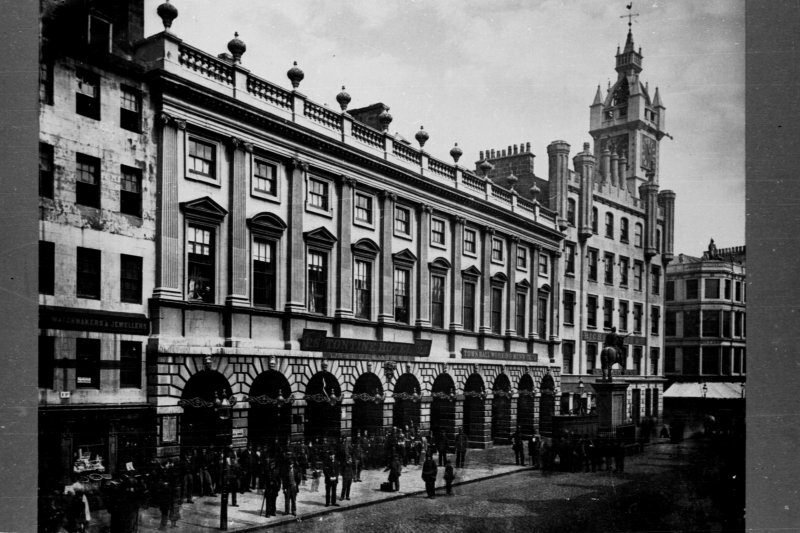 Trial pits were excavated at the Trongate entrance, in a courtyard off Parnie Street, Chisholm Street, and in the courtyard to the W of the original church building. Apart from a few sherds of residual medieval pottery, no remains of archaeological significance were found in any of the trial pits. A watching brief on further below-ground disturbance to the N and W of the Tron Theatre was recommended. In June 1997 a contractor's trial trench on the W side of the church at the N end revealed a cobbled paving 0.3m below the current surface below which was a garden soil containing modern and some medieval pottery. A large fragment of human skull was found at the top of the garden soil. Residual human bone was also found on the N side of the former church on the W side in a contractor's trench, in a mixed fill, about 0.5m below the present surface. The human bone no doubt originates from the graveyard of the collegiate church. In September 1997 a watching brief on two contractor?s trial pits on the Parnie Street side of the development revealed only modern deposits over natural. Development on the site is ongoing and further archaeological work is expected. NS 595 649 The Tron Steeple (NS56SE 21) is currently undergoing a comprehensive conservation exercise and refurbishment that includes the rearrangement of the early floor structures within its lower stages. The object of this study, in September 2002, was to record the woodwork of the floor structures at each level within the tower, and the bell frame itself. The tower was constructed in the early 1590s, and the surviving early floor structures formed of roughly squared pine common joists at lower levels can probably be associated with this period. It is clear that there had been four original floor levels. The upper parts of the tower and the present spire are known to have been constructed c 1637, although the junction between the old and new work was not clearly identified. The fourth and uppermost level of early flooring for which there was evidence (but no surviving timberwork) appears to have belonged to this phase. The form of the floor was not wholly determined, the joist sockets having been infilled and their alignments obscured. The three existing arches at pavement level are known to have been inserted in c 1855 under the auspices of the Glasgow architect John Carrick. The existing timber bell frame is an extensively modified structure of low-frame, single pit type that contains major elements of early fabric in its upper parts that are presumably datable to the period of manufacture of the bell itself, the 1630s. The surviving upper parts of the frame appear to be of oak while the bell headstock is apparently of knotty elm. 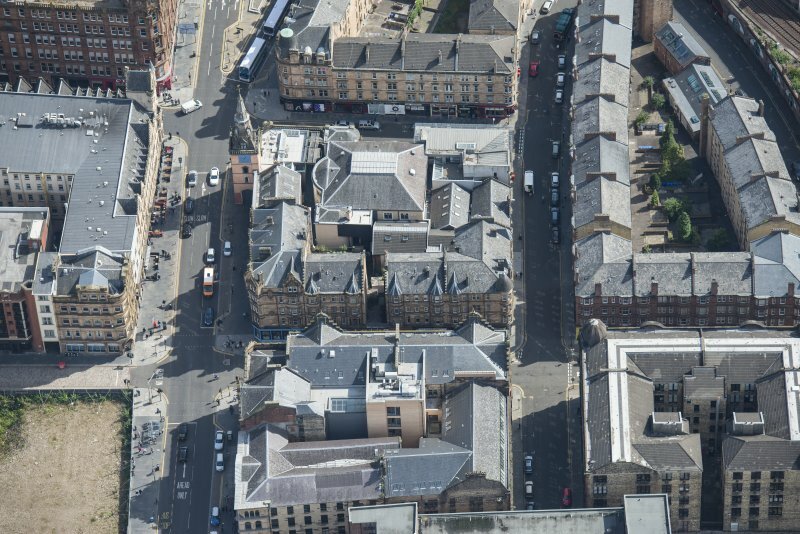 Sponsor:	Glasgow Building Preservation Trust. 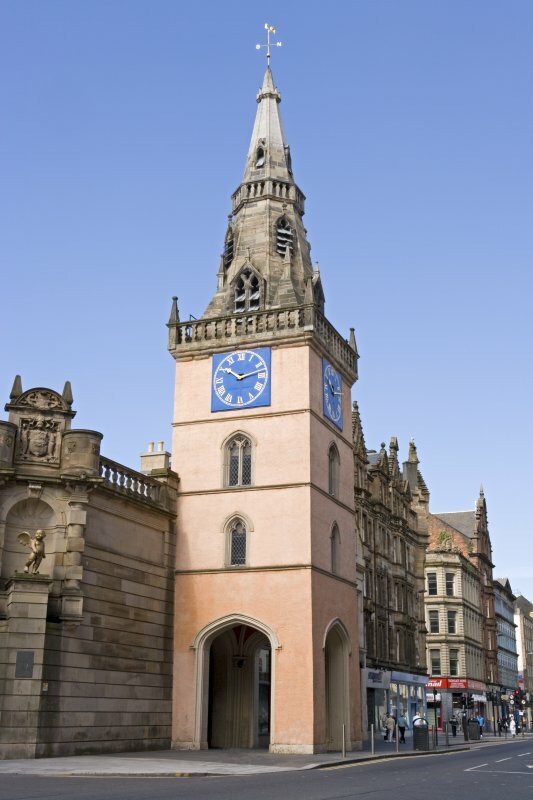 Original church on site founded in 1484 as Church of St Mary & St Anne, became City Kirk in 1592. 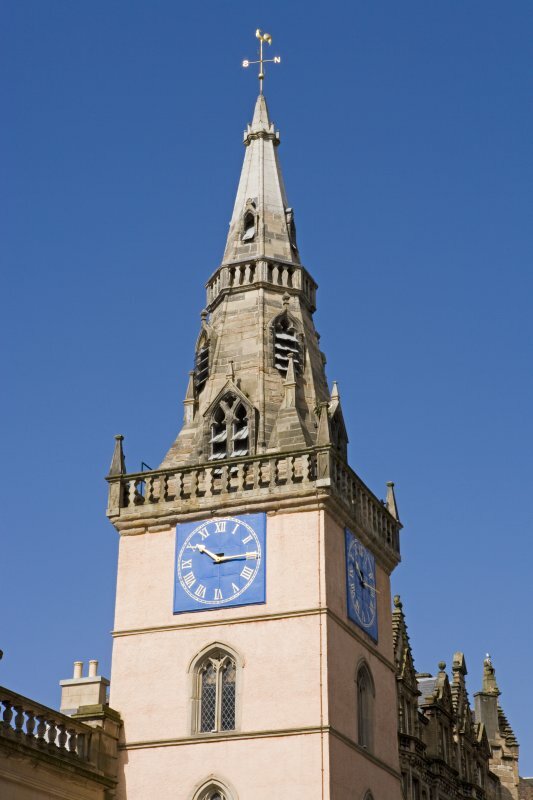 The Tron Steeple stands independent (tower c.1592, steeple 1630-1636). Tower pierced at ground level by Tudor arches by John Carrick 1855. Steeple remained after fire 1793, kirk destroyed. Replacement church by James Adam 1793 - 1794, set back from Steeple. Tron Kirk now Tron Theatre. Tron Theatre redevelopment by RMJM 1998.